So you can stomp nearly any trick in the book; but, does it look steezy? The Ronix Parks Wakeboard Bindings don't just offer pro-level support, but also free up leg mobility with their shorter cuff design. Now you'll have the flex needed to tweak grabs further and to navigate the airspace with composure. Of course, the Parks comes with Brainframe Technology, an Intuition+ Liner and Feetbelts so you can shoot for the flats knowing the knees are safe from destruction. 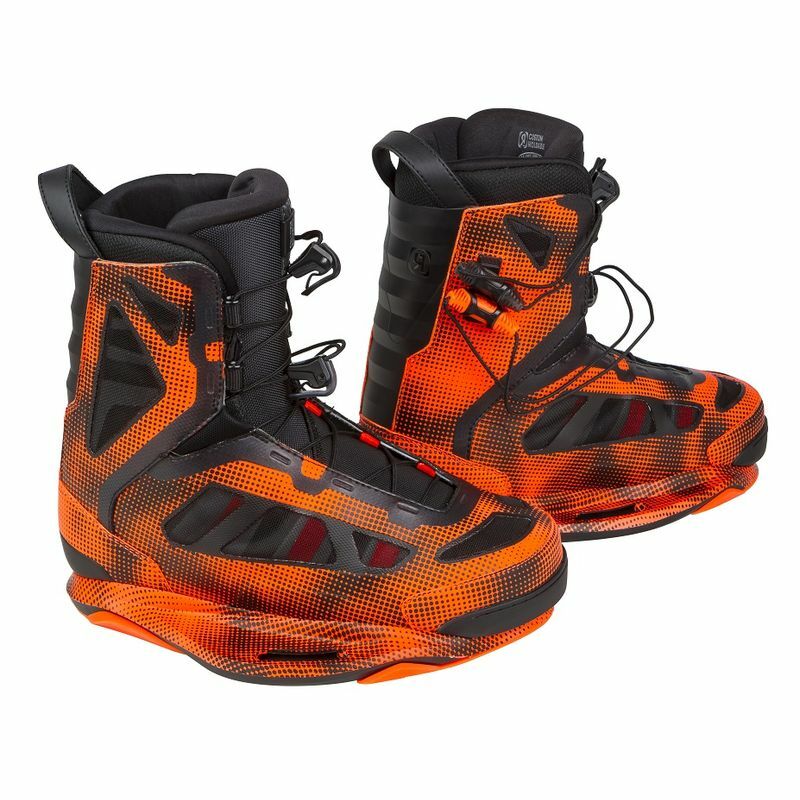 Crank up the style and step into some of the most luxurious boots on the market, the Ronix Parks Wakeboard Bindings. Feetbelts - Pulls your foot back into the pocket. Please fasten your feetbelts and enjoy the ride. Offers the ultimate heel hold. Intuition+ Liner - The pinnacle of custom fit boots. A level of fit and control only found in a Ronix boot. Quick Snap Lace Handles - New for this season, these parts offer an easy and solid tether to the boot. Easily interchangeable parts for service. Brainframe Technology - Ronix's groundbreaking hardware platform delivers instant response and redefines high end boot fit. Mag Lock Beams - Magnesium?s amazing strength to weight ratio allows us to cut the parts? weight by 30%. Brainframe models have never been so light. Rad Foam - Molded in under your feet to stand up to those big landings. The shock dampening is sooooo rad. Double Stuff Footbed - Hard on the outside, soft on the inside, an underfoot combination rivaling milk and cookies. The double stuff footbed allows your foot to naturally cant inward without dictating a specific cant angle.